Why Is It My Refrigerator Won’t Get Cold But Freezer Will? This is a refrigerator question we see quite often so I wanted to explain the two most common problems to look for when your refrigerator won’t get cold but freezer will and why this happens. 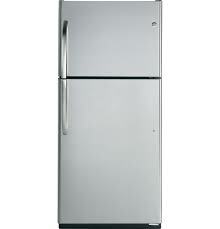 It happens with both top and bottom refrigerators as well as side by side refrigerators. 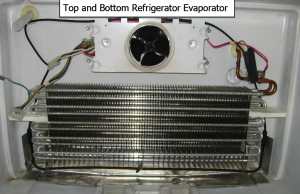 Your refrigerator has an evaporator (the coils that the Freon flows through in order to pull heat out of the refrigerator) that is located in the freezer. The evaporator fan circulates the cooled air throughout the unit so first you want to make sure that the evaporator fan (the fan in the freezer) is running. If the fan is not running then there is no circulation of air in the unit which of course causes the refrigerator to become warm. If the compressor and condenser fan motor (the fan by the compressor) are running then the evaporator fan should be a well, if it’s not then that is the problem. Every 8-12 hours depending on your model refrigerator an automatic defrost cycle starts which shuts down all the fans and compressor and turns a defrost heater on. The defrost heater (located on or under the evaporator) melts the ice that builds up on the evaporator coil. If a component of the defrost system fails then over a period of time ice will build up on the evaporator and if it goes without repair for long enough it will pretty much just become a block of ice and the fan can no longer circulate the air properly throughout the unit which causes the refrigerator side of the unit to become warm. If your refrigerator won’t get cold but freezer will but do not know what steps to take to repair the problem and would like to know how we can help, visit our tech help service center for more information.